Max. Board Size: 60 sq. in. Max. Board Size: 30 sq. in. * Standard Spec pricing assumes lead-free HAL. Alternatively, board finish may be upgraded to ENIG or Silver at no additional cost in the rare event lead-free HAL becomes temporarily unavailable. ¹If overall height or length is less than 1 inch, board will be increased to 1 inch and routed as a rectangle. Three low-cost options great for small quantity PCB prototyping needs. 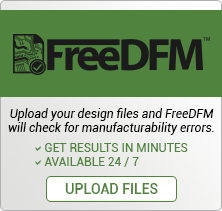 These are manufactured quickly and with few restrictions, using the same high-tech equipment as our full service PCBs. **$50 additional charge per order for a multipart/array. We'll credit the cost of your Barebones™ when you place a Standard/Custom Spec order. CREDIT DOES NOT INCLUDE SHIPPING AND HANDLING. CALL FOR DETAILS. Multi-part or step-and-repeat *$50 additional charge per order. No internal routing (cut-outs). No slots or overlapping drill hits. No scoring, tab rout, or drilled hole board separations. Min. 0.010" hole size. Maximum 50 drilled holes per sq. inch. Special Pricing Options: Credit Card payment only please. 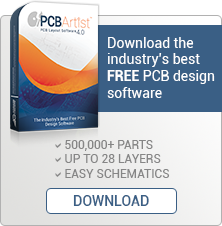 If using PCB Artist® to place a $33/$66 Each Order, please Click Here.